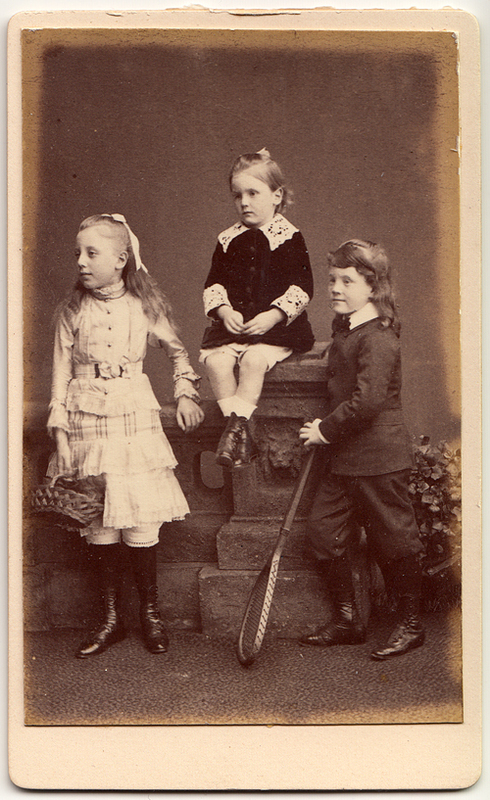 These beautifully dressed children are the Burrells: John Percy, Sermonda and Randulphus Clement who lived at Merrion Square, Dublin. 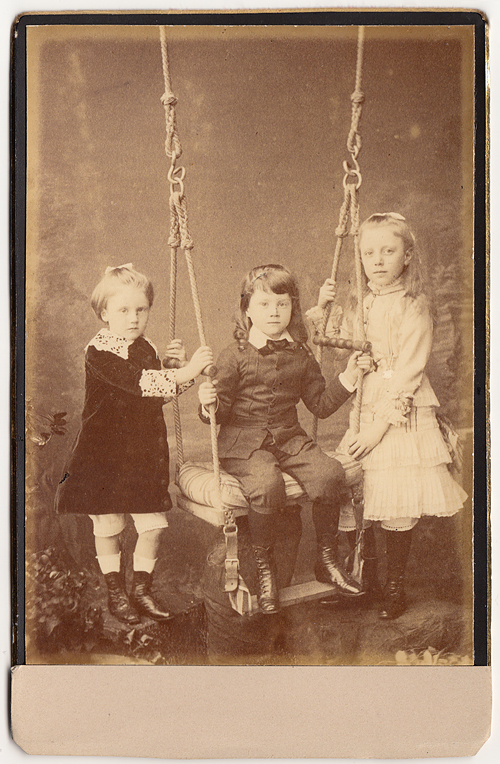 Their cartes-de-visite portraits were taken in 1882 by the firm of Louis Werner, 15 Leinster Street, Dublin whose work is featured elsewhere on this blog. The family’s home was on nearby Merrion Square only a few minutes from Werner’s studio. Randulphus wears a dark velvet dress tunic with shoulder wide lace collars and matching cuffs. John Percy is sporting a Norfolk style suit of knee length breeches with a long single-breasted jacket buttoned and a waist-belt. An advertisement for the Dublin tailors Hyam, 29 and 30 Dame Street from December 1882, reveals the variety of boys’ suits which were available in the city. They sold the following suit styles: Tunic, Marquis, Norkfolk, Leopold, Napier, Oxford, Cambridge, Refer and Diagonals in materials which included serges, tweeds, worsteds, twills, naps and Cheviots. Like her brothers Sermonda wears leather buttoned boots. Her frilled tiered skirt includes a layer of tartan patterned material and it is worn over scalloped knickerbockers. Her high-necked belted blouse includes a single row of buttons and she wears a ribbon bow at the back of her head. The photographer’s props include a basket and tennis racket and the novel fake swing upon which John Percy sits. Their mother Mary (née Parks) from Golagh House, County Monaghan was one of the earliest biographers of the composer Richard Wagner. She travelled across Europe amassing a substantial collection of manuscripts which were given to the Curtis Institute of Music in Philadelphia (the archive was subsequently sold and dispersed). 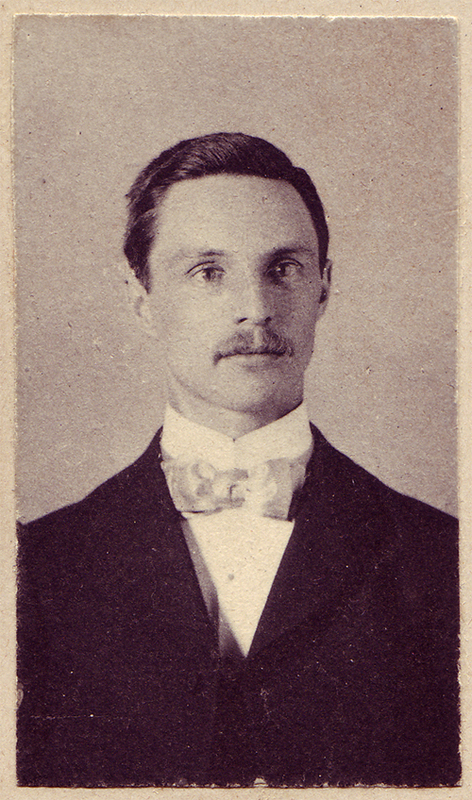 Their father, Willoughby Merrik Campbell Burrell, 5th Baron Gwydyr, was a Fellow of the Royal Geographical Society. You can see a striking photographic portrait of him, taken by the renowned London studio of Camille Silvy, here. The children’s maternal grandfather, Sir John Banks, was president of the College of Physicians who also kept a house at 45 Merrion Square. Unfortunately, his medical connections did not prevent the death of young Randulphus who died aged 6 at 11 Merrion Square in 1882, the year in which these photographs were taken. 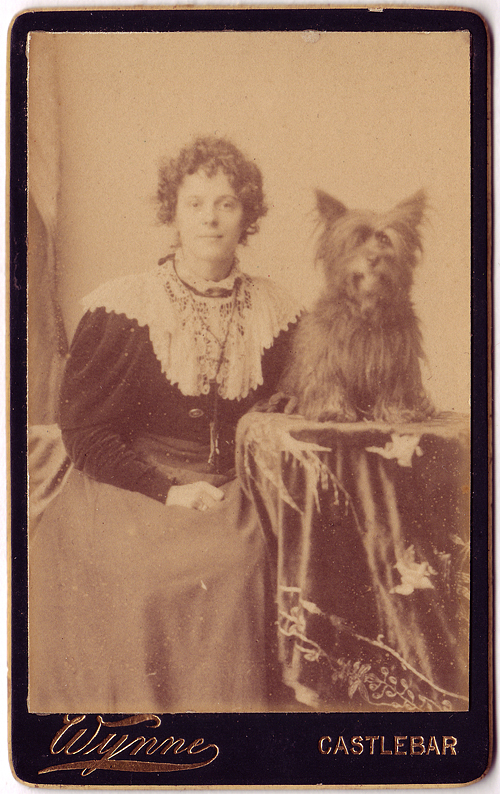 Sermonda is pictured above in two gorgeous portraits taken in June 1877 by the studio of M. Allen & Co., 12 Westland Row, Dublin. You can see another example of the photographer’s work here. Her scalloped white cotton or linen dress is adorned with an outsize tartan bow and sash. 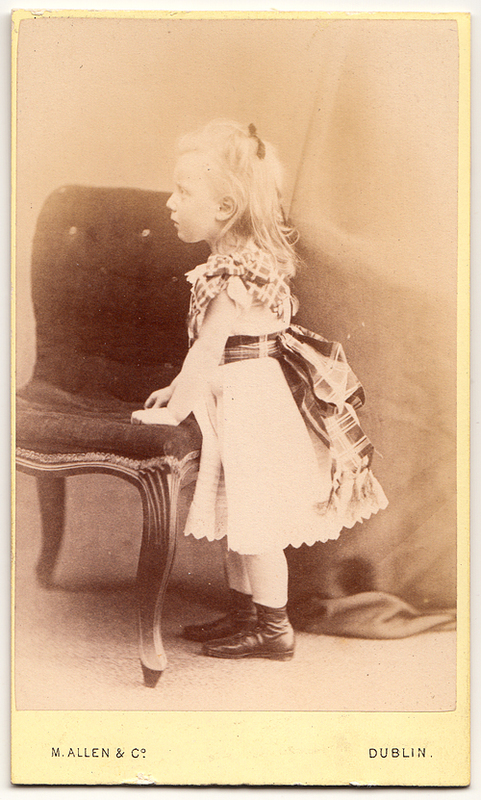 The ensemble is typical of the restrictive children’s clothing which often mimicked the styles worn by their parents. 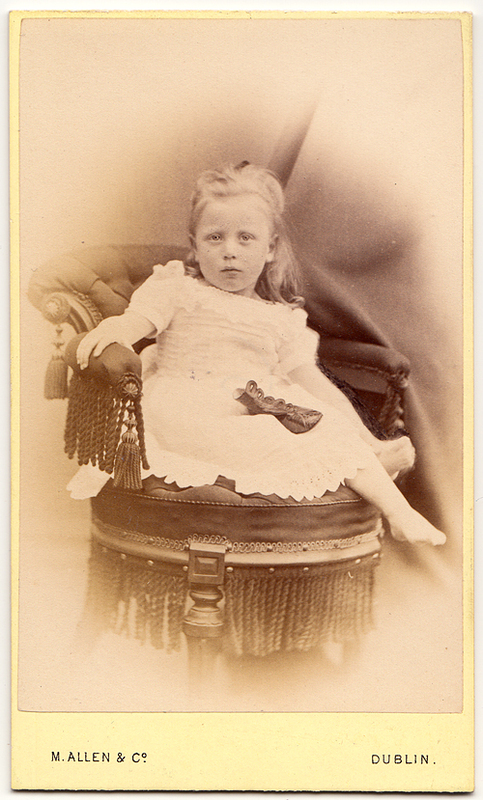 Indeed in the second image, the little girl has abandoned the sash and bow and is sitting in a more relaxed pose with one of her button boots upon her lap. Sermonda attended the Dublin Metropolitan School of Art from an early age. She enrolled at the age of eleven in 1885 and you can see a link to her attendance record (up to1890) here and an example of her work here. Her brother John Percy was to die at the age of 24 having served in the diplomatic corps in Russia. Sermonda married Sir John Henniker-Heaton, the son of a journalist and postal reformer, who was credited with the introduction of the universal penny post. Their daughter compiled her father’s letters into book format and they provide some insights into Sermonda’s personality. She mentions that her parents were frequent visitors to Ireland. Unfortunately, her early home Golagh House, which was built in 1703 was burned down during the Civil War and the rubble used to build the local Catholic Church. 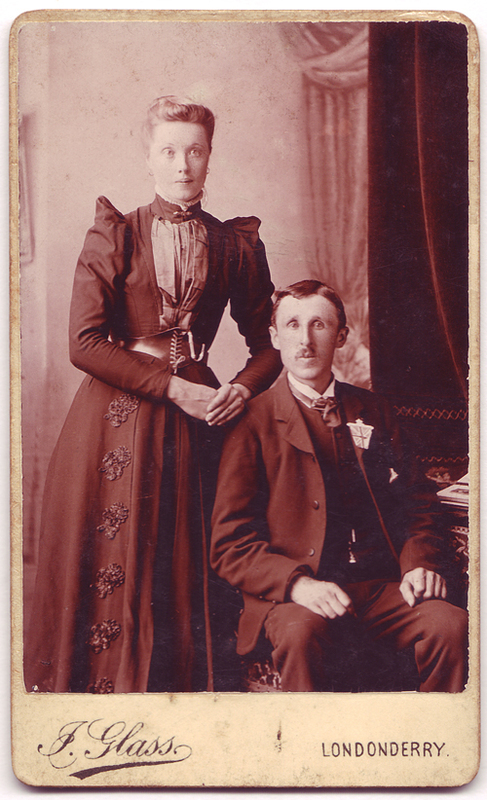 Sermonda was to outlive her brother John Percy by 56 years, dying in 1958 at the age of 84. She was buried at Tunbridge Wells, Kent and her grave is pictured here. One of her adult children, was to disappear in the early 1970s under strange circumstances. John Victor Peregrine Henniker-Heaton went missing from his home in London in 1971, several sightings were reported and some presumed that his disappearance was related to his post-Second World War intelligence activities. In a bizarre twist, his son discovered his father’s skeletal remains in a locked room in their home in 1974. You can read about the unusual case here. 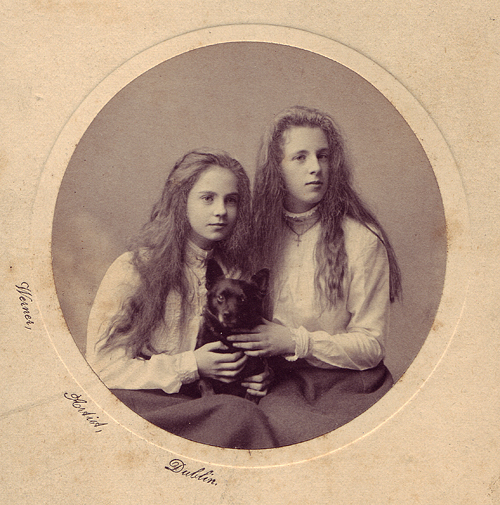 This pair of Northern Irish studio portraits feature two tightly laced ladies whose cinched-in waists are accentuated by belts or corsets worn as outwear. The photograph by J. Glass dates from the 1890s and shows a woman wearing an unusual leather laced belt with an attachment that looks like a telephone cord! 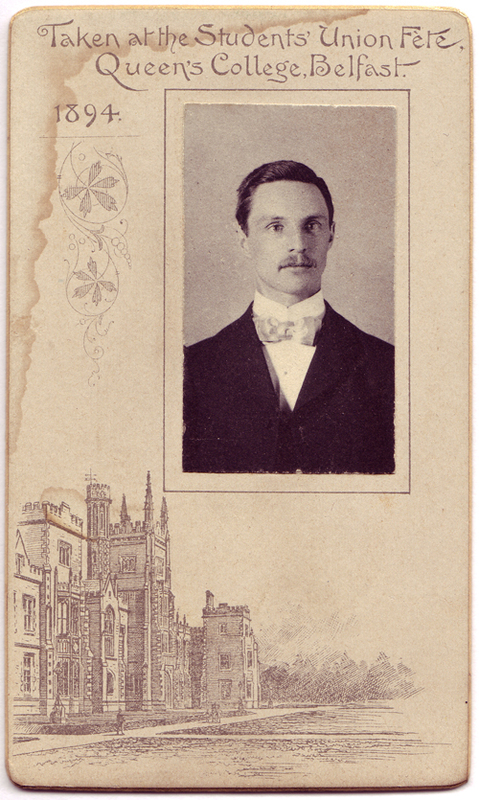 The verso of this carte-de-visite incorporates a design which was registered by Marion and Co. in 1894. The woman’s husband wears a Union flag, demonstrating his political affiliation and loyalist leanings. The photograph from Belfast is very similar to another image I posted about a few years back. 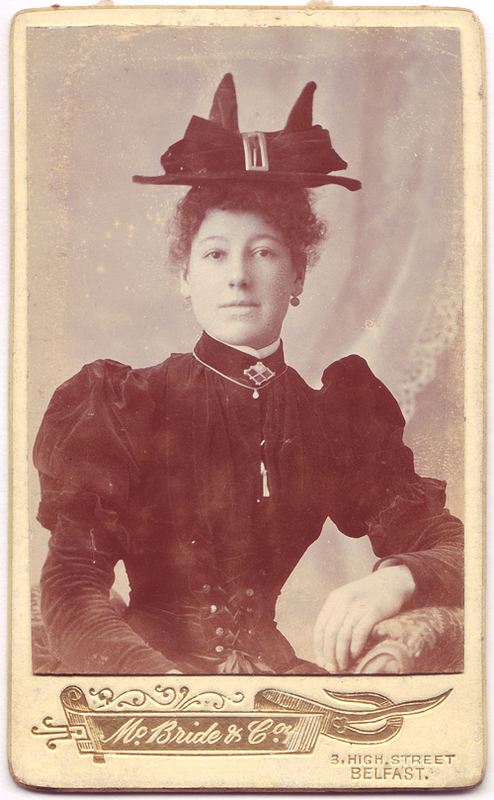 I love her precariously balanced hat which includes a large bow and buckle feature. The high neckline accentuated with a brooch; ruched velvet bodice and puffed Juliet sleeves are typical of the time. Her tight lacing may, in fact, be part of the bodice of her dress rather than a separate guêpière or waist cincher. Whilst researching this post, I came across many phrases to describe a variety of exterior corsets, for example, corselets, Swiss waists, waspies, waist cinchers and guêpière. Fortunately, The Dreamstress site had an excellent post which clarifies the difference between some of them and which you can read here. The firm of McBride and Co., 3 High Street, Belfast, were (see W.A. Maguire’s A Century in Focus: Photography and Photographers in the North of Ireland, 1839-1939) at this location between 1894-1901. This dates both photographs to a similar time period and indeed the women’s silhouettes are remarkably alike. This photographic souvenir of the Students’ Union Fête at Queen’s College, Belfast was produced by the well-known photographer Abernethy. The 1894 fête/fair was organised to raise funds for a new building and was a spectacular event. Its various attractions and exhibits are outlined in detail in an accompanying guide called The Book of the Fair which was published by Olley & Co. It provides a fascinating insight into the commercial and social life of the city in the late nineteenth century. I really like the fact that this portrait can be linked to a specific event and despite its small size, only H 48mm x W 28mm, the image is strong and clear. The surrounding mount depicts the college’s main building designed by Charles Lanyon in a Gothic Revival style. Whoever the sitter was, I hope he enjoyed all the fun of the fair which included a ‘Living Aunt Sally’ under the management of the Arts Students and a performance by the Clifton Banjo Society!